In the 10 years since Jane Kenyon's death at the age of 47, her reputation has only grown. 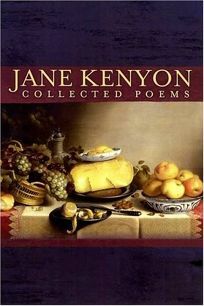 Her books are assigned; her life has been memorialized by husband Donald Hall in the book-length elegy Without (1998) and The Best Day the Worst Day: Life with Jane Kenyon, a memoir out just last month from Houghton (Reviews, Mar. 7). This collected edition reproduces verbatim the four books Kenyon saw through to press; the poems from two posthumous collections, Otherwise and A Hundred White Daffodils; Kenyon's translations of Akhmatova; and four previously uncollected poems. It's a case of more being less: gems like ""Let Evening Come,"" ""Otherwise"" and ""Briefly It Enters, and Briefly Speaks"" feel a little hidden here, despite Kenyon's careful composition and ordering of her work. The selected Otherwise will remain the Kenyon standard, but fans will be glad to have everything portable and in one place. Kenyon's struggles with depression are central to her work; taken as a whole, Kenyon's poems remain a sustaining record of a life staked out in very difficult terrain.